When Did LeBron Stop Being a Man-Child? Watching LeBron James carry the Miami Heat to the NBA Finals over these past few weeks, we were struck by a random thought. In his younger days James was often referred to as a "man-child," owing to his freakish, hulking physique and precocious skills. (Despite popular usage, a man-child is properly defined as a child displaying manlike qualities, whereas a Will Ferrell–character type — an emotionally stunted adult — is more accurately labeled a child-man.) Clearly, this moniker no longer applies — James, now 27, isn't a man-child, but a straight up man. A man-man, if you will. But when, exactly, did James transform from a man-child into a man-man? As the Finals kick off tonight in Oklahoma City, we decided to find out. To determine when James stopped being a man-child, we tallied how many times he was referred to as a "man-child" in newspaper articles for each year of his life. As you can see in the above graph, the label was first applied to King James as a high-school phenom at the age of 16. James then reached peak man-childness at the age of 18, after which point America's sportswriters gradually decided that James was a full-fledged man. To test whether 18 served as a cutoff for not just James but for all man-children, we performed the same newspaper search for Greg Oden and Dwight Howard, two other physically intimidating big men who came into the NBA at a young age. 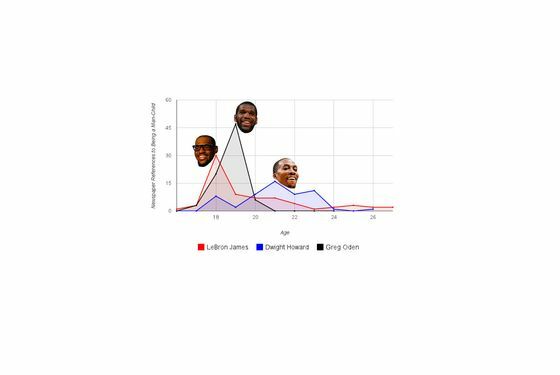 As the graph shows, Oden reached his peak man-childness at 19, but was already considered a man by the age of 20, when he began his injury-delayed rookie season in the NBA. And Howard's man-childness peaked when he was 21, but, for some reason, seems to have extended all the way into his 23rd year of life. What this tells us is that the upper boundary of man-childhood, while flexible, falls somewhere between 18 and 23. After that, you're a man and, with enough sulking and whining, a child-man.